When a whale dies its cadaver sinks to the bottom floor where it provides the equivalent of over 2,000 years of normal biological detritus to the local ecosystem. In other words, if you're a scavenger lurking in a small-time cave, and a whale corpse falls nearby, you've got your meals planned for a long, long time. And you're very happy. These whale-falls prove to be such a boon to its environs that they create their own ecosystems. The first shift scavengers are your sharks and hagfish. They show up to eat all the flesh. Next come the bacteria, to colonize the bones. Then come the bristleworms. Nine new bristleworms have recently been discovered on whale-falls . It's quite possible that many of these new bristleworms can live only on whale-falls. 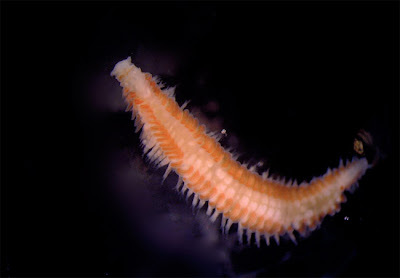 Other bristleworms are equipped with special root systems that allow them to devour whale bones directly. Though these new ones don't seem to have any such specialized equipment, some do seem to feed on the bacteria that bloom on the whale skeletons. Whatever the food of choice, whale-falls seem to be veritable manna from heaven for bottom-dwelling ocean denizens. With the economic downturn, couldn't we all use a good whale-fall? It'd be nice to walk outside one day and see pallets of food and cash drift down from the sky and land in my yard. I may have to fight off other first-shift scavengers, like my neighbors. Then there'd be second- and third- shift scavengers, the salesmen and local businesses and politicians who catch wind of my good fortune and try to sell me stuff, and the family and friends who try to mooch off me. But that's okay. I can share. what a nice perspective. i like your thougth process...being the primary scavenger...humm...you make me smile. thanks for the smile and the thought. Maybe we need to look at dragging some of the carcasses that wash up on beaches out to sea and dropping them. I know that in some areas, the clean up of whales can be difficult as most areas do not want to wait for nature to take its course as the land dwelling scavengers do their thing. HMMM?? ?